Amelia Marneau, co-owner and executive pastry chef of Marche Moderne in Newport Coast, creates flawless desserts, everything from French-inspired pâtisseries to flawless ice creams. Made with the finest ingredients, the flavors are beautifully balanced. The textures are designed to be addictive, the presentations splendidly orchestrated. She works as one half of a perfection-seeking team with her husband and co-owner, Florent Marneau, the French-born executive chef. Some critics have named their restaurant the best French bistro in California. I wouldn’t argue. It could be assumed that working so closely with your mate might present a list of challenges. But Amelia Marneau says that they both thoroughly enjoy it. Since their relationship began long ago when they worked together at the long-shuttered Aubergine in Newport Beach, they have inspired each other. Although she has Italian roots, the two share a common passion for French cuisine. Her French culinary skills were honed at the Cordon Bleu in Paris, but she grew up in Pacific Palisades with her grandmother. Summers were spent in Italy with her mother. 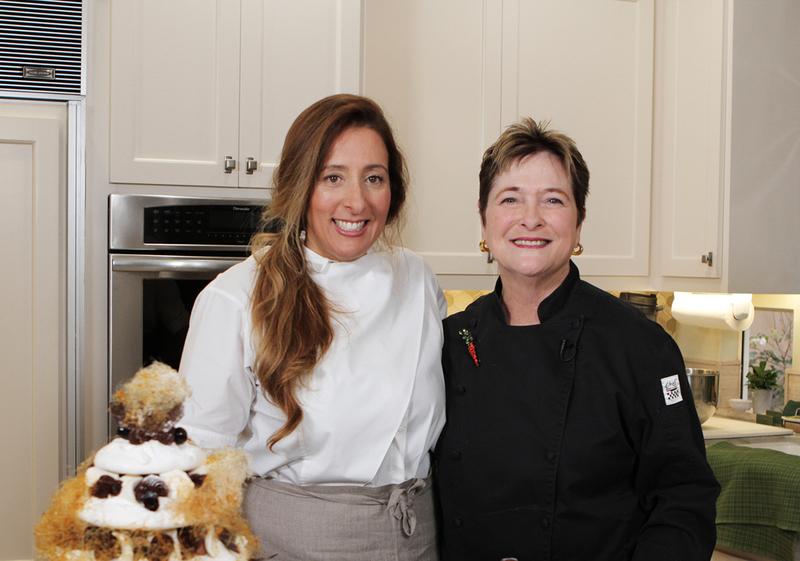 Hoping to capture her enthusiasm and witness her talent, I invited her into my kitchen to shoot a video showing the creation of a Marneau masterpiece themed to Valentine’s Day, a Black Forest pavlova. It was her sweet homage to love, a four-tiered pavlova replete with chocolate mousse, chocolate ganache, chocolate cake, Chantilly cream, and Luxardo cherries. 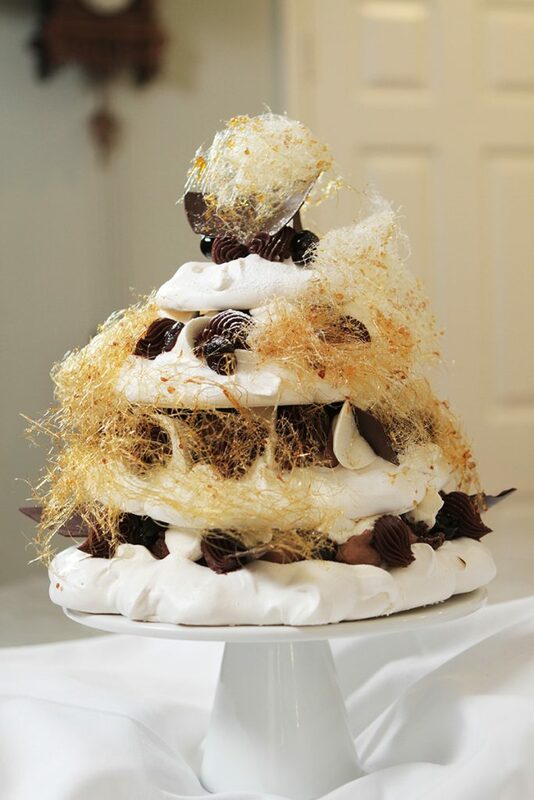 Adorned with nests of spun sugar, it looked magnificent. It was delicious, too. Knowing that most home cooks would consider it as unattainable dream to make such a time-consuming treat, she offered a less-complicated pavlova that would be perfect for at-home entertaining. 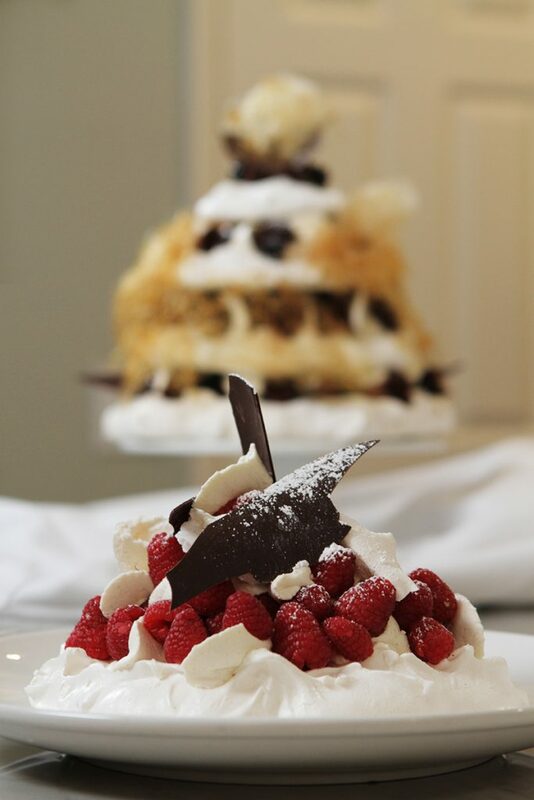 This more-practical approach showed off a round of baked meringue topped with sweetened whipped cream and fresh raspberries, plus a large shard of chocolate to crown it off. Secret Talent: She is gifted at flower arranging and makes many of the arrangements used at the restaurant. She finds it relaxing. She likes monochrome arrangements that take on a whimsical feel. If she uses dahlias, one of her favorites, she mimics the hue in all the other floral elements. Go-to Snack: A beautiful baguette topped with tapenade drizzled with high-quality Italian lemon oil. Accompanied with a kir royale. A Rarity: When asked if pastry chefs are disappearing from Orange County restaurant staffs, she said that indeed it is becoming a lost art. Pastry positions are hard to find. At Marche Moderne, they have a team of pastry chefs. In her opinion, dessert is the final impression of a meal; it should be something amazing and well-prepared. Beach-Side Baking: Napoleons are one of her signature dishes. She says that it’s complex and requires more attention to detail than many are willing to commit. When the restaurant moved from Costa Mesa to the location across from the ocean in Newport Coast, she had to make adjustments. The puff pastry for the Napoleons needed to be baked right before service; to make it crisp, it needed to be baked until it achieved a darker color to adjust for the increased humidity. Sugar Trials: In the pastry chef world, one of the biggest challenges is creating spun sugar, the caramelized sugar that is flung into hair-like strands and generally used to adorn a croquembouche (cream puff tower). It’s seldom seen here, but in Europe, it is common, especially in big hotels that have temperature and humidity-controlled rooms specific for pastry cream, chocolate, and sugar. Spun sugar is very temperamental. It must be stored in an airtight container with an antihumidifier packet. She said that when making the spun sugar for a photo shoot, she made a beautiful mess at the restaurant. Finale Trends: Well-done, classic desserts are in style with flavors that melt in the mouth. Molecular cuisine can be a small addition to the plate. The new must-use new ingredient at the moment in France is tonka bean. With a flavor something like nutmeg, it can be shaved on top of ice cream or chocolate desserts. Pavlova: Using a pencil, draw four circles (one with 8-inch diameter, two with 6 1/2-inch diameters and 1 with 4 1/2-inch diameter) on sheets of parchment paper; turn paper over, and you should be able to see those circles on the opposite side; place on rimmed baking sheets. Preheat oven to 250 degrees. Beat egg whites and pinch of salt until frothy in electric mixer on medium speed. Increase speed to high and add sugar a tablespoon at a time; beat until stiff but still glossy. Add vanilla and beat just enough to incorporate. Place a small spoonful of meringue on four corners of baking sheet and use it as a “glue” to hold parchment in place. Spoon onto circle around perimeter, making uneven surface with little mounds and valleys, about 3/4 to 1-inch thick. Bake in preheated oven still pale but crisp, about 2 to 3 hours. Cool. Chocolate Cake: Preheat oven to 350 degrees. Butter 9-by-13-inch baking dish; line bottom with parchment paper. Place chocolate and butter in top of double boiler over barely simmering water; melt chocolate, stirring frequently. Remove top pan and wipe any water off the bottom of the pan. In separate bowl, whisk sugar with eggs until light yellow color. Fold egg mixture with chocolate mixture. Stir together baking soda and flour. Add all dry ingredients in three batches, alternating with the buttermilk. Pour into prepared pan filling a little less than 2/3 full (use any extra batter to make cupcakes). Bake in middle of preheated oven until toothpick inserted in middle comes out clean, about 30 to 35 minutes. Cool 15 minutes. Run a knife around edge of cake (if top is mounded, cut off portion of top to make it even) and invert on cutting board or platter. Remove parchment paper. Spoon Kirsch Soaking Syrup on top. Chocolate Mousse: Melt chocolate with butter in top of double boiler over barely simmering water, stirring frequently. Remove top portion of double boiler and wipe bottom to remove any water. Place yolks in separate bowl and stir in about 1 tablespoon chocolate mixture. Repeat with a second tablespoon of chocolate mixture, and a third. This will prevent yolks from scrambling. Beat egg whites until soft peaks form in electric mixer on medium speed. Increase speed to high and add sugar a tablespoon at a time; beat until stiff but still glossy. Fold chocolate mixture into whites; refrigerate until firm. Place in pastry bag fitted with large plain tip. Chocolate Ganache: Place chocolate in heatproof bowl. Bring cream to simmer on medium-high heat. Remove from heat and pour into chocolate; whisk to melt chocolate. Place in pastry bag fitted with large star tip. Chill. Chantilly Cream: Whip cream and powdered sugar in electric mixer until thick enough to pipe. Place in pastry bag fitted with large star tip (she used a plastic St. Honore tip). Assemble: On footed cake plate, pipe a dab of chocolate mousse in center. Top with largest meringue. Top with square of cake. Make zigzag of mousse on top of cake and mounds around the cake on top of meringue. Place drained cherries on mounds and on zigzag. Scatter a few crumbles of Pirouette cookies on cake. Top with second largest meringue. Pipe stars of Chantilly cream and ganache intermittently between the layers. Repeat with cake, mousse, cherries, cookie crumbles, and Chantilly cream. Repeat using two more meringue layers, ending with smallest. Top with a chard of chocolate and dust with powdered sugar. Marche Moderne is at 7862 Pacific Coast Highway, Newport Coast.